Trends in the fleet management industry: what to keep up with? When Uber introduced its Uber Freight app in 2017, the company was seeking to reach the same level of disruption their ride-sharing app did but it failed to succeed. It appeared that shippers and carriers need to know more than simply a truck’s location and vehicle characteristics. Businesses involved in transporting cargo require more complex solutions: maintenance scheduling, registration, tracking, driver management, and operation costs are only the tip of the iceberg. Thousands of carriers take steps to become more efficient every day by embracing fleet management technologies. So it makes sense to dive deeper into this topic. In this article, we’ll describe fleet management software (FMS), its core modules and functions, overview the major FMS providers, and comment on what is currently trending in this industry. Fleet management software is a standalone app or a cloud product that helps businesses maintain optimal use of their work vehicles from a central platform. 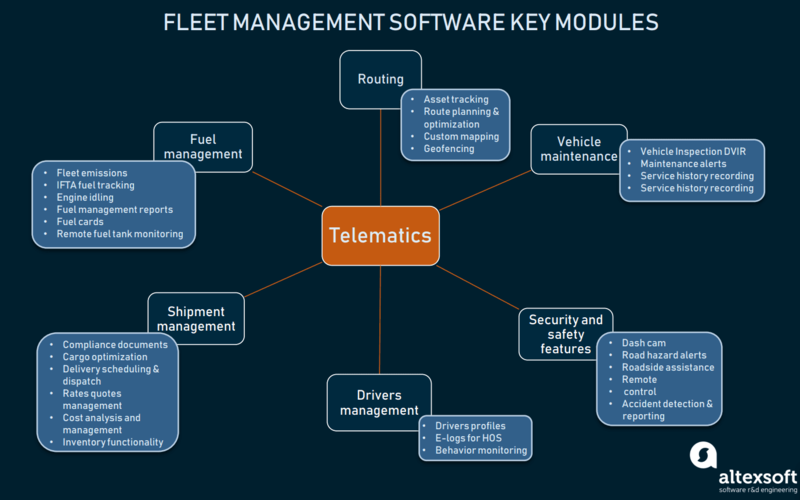 Besides the software, fleet management involves the use of a telematics unit (which we discuss further) with a human interface device. FMS allows for tracking a large number of a vehicle’s data: speed, temperature, engine block, fuel level, door opening, geographical location, route direction, etc. Received from a vehicle’s sensors, this data is displayed to the manager who can track all their vehicles in real time, determine when they’ll get to the destination, and how well the vehicles are handled by the drivers. maintains compliance with major regulations for commercial drivers. In the US, for instance, these would be Hours of Service (HOS), International Fuel Tax Agreement (IFTA), and the Compliance, Safety, Accountability (CSA) initiative. Telematics is a term that describes the use of information technology in remote communications. 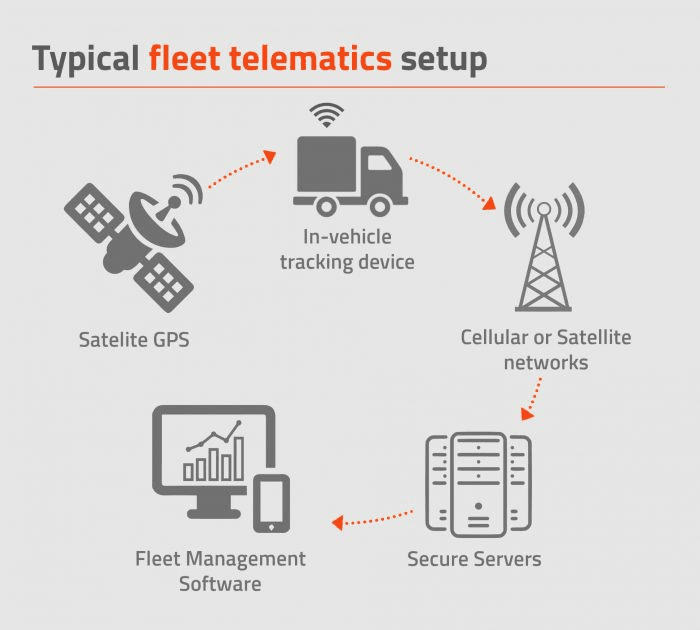 Fleet telematics is the system that supports the exchange of information between vehicles in the fleet and central locations. It’s a small black box installed under the dash and connected to the diagnostics port or the CAN (Controller Area Network) bus port. A telematics device records the information from the vehicle using GPS and onboard diagnostics. A telematics unit can freely integrate with other hardware (Electronic Logging Device, driver cameras etc. ), software, and mobile apps to provide insight into different freight-related business operations. Routing – helps make logistics decisions based on vehicle GPS position, duration of stops, speed, etc. Fuel management – tracks fuel consumption tendencies to minimize idling time, emissions, and more. Vehicle maintenance – streamlines the process of diagnosing and inspecting, reminds of routine checkups. Drivers management – stores personal profiles and hours of service to analyze productivity and behavior. Shipment management – analyzes expenses, quotes, licenses and more to optimize delivery, dispatch, and cargo placement. Security and safety features – assist drivers with any safety issues on the road. The FMS routing module uses the data collected via a telematics device to provide a fleet manager with real-time updates on vehicle location, miles traveled, with status updates from anywhere. Asset tracking. Installed in the dashboard, a GPS locator beacon allows fleet managers to track and study the vehicles in the fleet. A radio frequency identification system steps up to maintain tracking in poor signal areas, for example, underground or in a tunnel. Tracking can be active, pinpointing a live vehicle’s whereabouts, and passive, capturing the ride data for further analysis – such as route optimization, driving speed, idling tendencies, etc. Geofencing. This feature provides various notifications on the vehicle’s whereabouts: when the vehicles depart, when it leaves pre-defined boundaries or operates during off-duty hours, etc. Route planning and optimization. While optimizing the route, basic factors to consider are time windows, stop durations, vehicle capacities, and lunch breaks. In addition, the system should timely alert on any road disruptions. Route optimization functionality plans efficient routes by determining the shortest and most fuel-efficient paths between each stop. Pairing route optimization with the fuel management module will save both time and fuel costs. Custom mapping. Route planning capacity can be further expanded with the ability to design your own business-relevant maps. Being highly customizable in terms of views, legends, zone shapes, and sizes makes your maps so convenient in use. 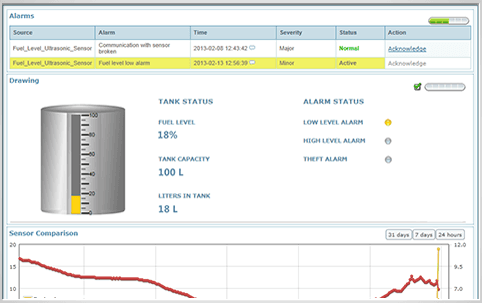 A fuel management module monitors a fuel tank and forms fuel management reports. This allows fleet managers to efficiently plan routes and coordinate drivers. Eventually, this helps reduce fuel expenses. Engine idling. This is one of the main fuel-guzzling habits. Many trucks idle up to eight hours per day resulting in increased fuel and maintenance costs. So to reduce fuel costs in the long run, it’s important to track and reduce idle time. Besides that, excessive engine idling hurts the environment. 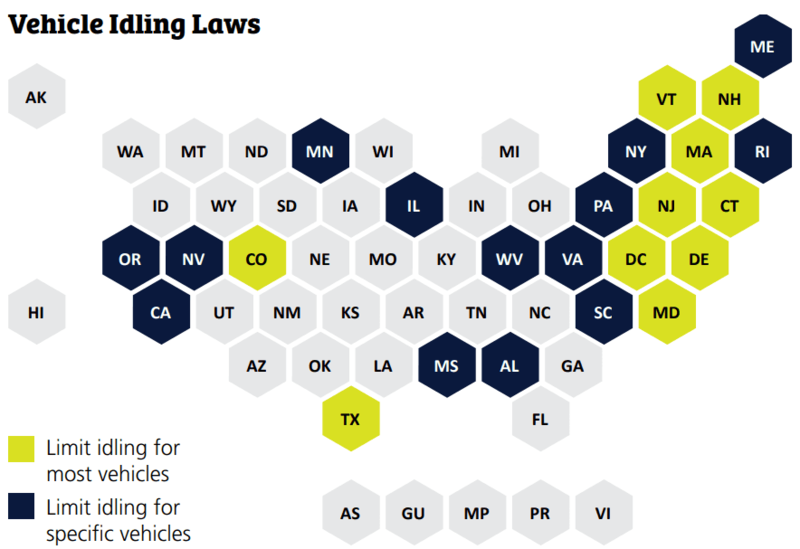 As a result, many US states have passed local anti-idling laws that permit on average three to five minutes of idling. To monitor idle time, fleet managers can use an FMS to set alerts that will notify them each time a vehicle idles over a chosen period of time. Informative reports on the time that drivers keep their engines running will also help manage driver behavior to prevent future idling. Fuel cards. As a specific form of cashless payment, fuel cards help keep a record of costs and scrutinize inefficiencies across the fleet. Among the key benefits of fuel cards are wholesale prices, secure purchasing, and close monitoring of fuel consumption via dedicated fuel card accounts. Remote fuel tank monitoring. The Engine Control Module (ECM) collects all sorts of data about the condition of your vehicle, including fuel quantity measurement. In fact, ECM provides miles per gallon/liter information to the vehicle dashboard and flashes the fuel indicator as a signal for a refill. By tapping into the ECM via a telematics device, the fuel monitoring system gets access to its data. Consequently, fleet managers can control fuel usage. Complemented with GPS location data, the software can pinpoint stages in journeys when fuel consumption peaks. Fuel management reports. These contain the information on every fuel purchase made. Therefore, by keeping an eye on this data, fleet managers can easily spot unauthorized purchases and set restrictions for each fuel card: the number of transactions, the quantity of fuel, and even the type of fuel that can be purchased. IFTA fuel tracking. The IFTA license is legitimate in 48 US states and Canadian provinces, and you’ll need it if your trucks cross state lines. The IFTA module assists in calculating the amount of tax due or tax credit for each state, to determine the tax liability for each and to oversee the distribution of funds accordingly. Once your vehicle is registered in one state, you are required to file quarterly fuel taxes through its base jurisdiction. Fleet emissions. Many carriers are now required to undertake carbon reporting as part of their procurement policies. Incorporating a software system into fleet management improves the emission regulation monitoring, as it provides a comprehensive analysis of energy/fuel economy, idling, eco-driving behaviors, and emissions for each vehicle. A vehicle maintenance module plans routine checkups and alerts about the needed diagnostics. Remote diagnostics. The utilization analysis feature gains insight into how your vehicles perform and which ones need replacement, helping with annual planning. 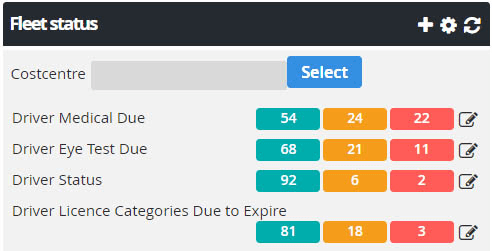 FMS gives users such business insights as the top 10 vehicles due for scheduled maintenance. Vehicle inspection DVIR. According to FMCSA regulations, Driver Vehicle Inspection Reports (DVIR) are logs with detailed vehicle operations and safety issues that must be filled out via a telematics-supported tablet during vehicle inspections. Once a report is submitted, fleet managers can easily identify, group, and monitor vehicles that require routine or urgent maintenance. If a report does indicate the need for maintenance, DVIRs incorporate a mechanic’s notes and updates. Sorting out DVIRs – reports on the defective vehicles, on the repaired ones, and on those certified as repaired — offers great visibility into the fleet conditions. Service history recording. FMS automatically logs a detailed history of the vehicle’s maintenance. This data can then serve for analyzing costs, tendencies in wear, neglect, and abuse, to further make effective fleet decisions. Maintenance alerts. FMS provides automatic engine diagnostic alerts, tracks service records and sets reminders for oil changes, tune-ups, and other routine maintenance. Should there be an engine fault, the system will be there so that the driver has access to a network of repair centers. This module helps to keep track of driver behavior and stores the related data. Driver profiles. FMS keeps your driver records up-to-date, organized, and easily accessible from a central location. By storing all driver licensing and medical information in the software, fleet managers can always check if their drivers have valid licenses, set up reminders for those whose license needs renewing, and ensure that drivers have taken and passed medical tests. Behavior monitoring. Having skilled drivers behind the wheel reduces accident risks and saves up to 12 percent on the fleet costs. That’s why monitoring driver performance will certainly pay off. You’ll be able to take immediate action if a driver demonstrates aggressive driving, acts fatigued, or distracted. The software explores driving habits by measuring g-force with a built-in accelerometer. This way a configured telematics device produces feedback on such driving parameters as acceleration, braking, and cornering. E-logs for Hours of Service (HOS). Attached to a vehicle engine, electronic logging devices (ELDs) automatically record driver working time – HOS. Implemented in 2018, the US ELD mandate controls the driving hours for commercial motor vehicles. The law is aimed at road safety by preventing fatigued and distracted drivers from working. So it’s important to ensure that your E-log satisfies all the FMCSA requirements. The shipment management module manages a fleet’s workflow, orders/deliveries, and expenses to reduce rework and increase income. Delivery scheduling and dispatch. Fleet companies need an FMS with strong scheduling and dispatch capabilities that make dispatching operations easier and more efficient. By maximizing dispatching and increasing schedule productivity, FMS helps the fleet get more jobs done on time. Rates and quotes management. As a part of shipment management, FMS assists long haul shippers in gathering carrier rates and quotes. Compliance documents. Licenses, tax reports, fleet insurance (including restrictions and due dates), and fuel transactions are carefully stored in FMS. In addition, the system provides timely alerts when a document is outdated or needs a closer look. FMS simplifies accounting and payment of fuel taxes by automatically generating and filing your quarterly tax reports. Cost analysis. By helping manage expenses (cost registration, fixed costs scheduling, cost/km and cost/hour ratios calculation, etc. ), FMS streamlines the related administrative processes. Apart from that, FMS conducts a comprehensive cost analysis providing a clear picture of what your budget is spent on. It’ll track the defined key metrics with the cost triggers, comparing them against the benchmarks. 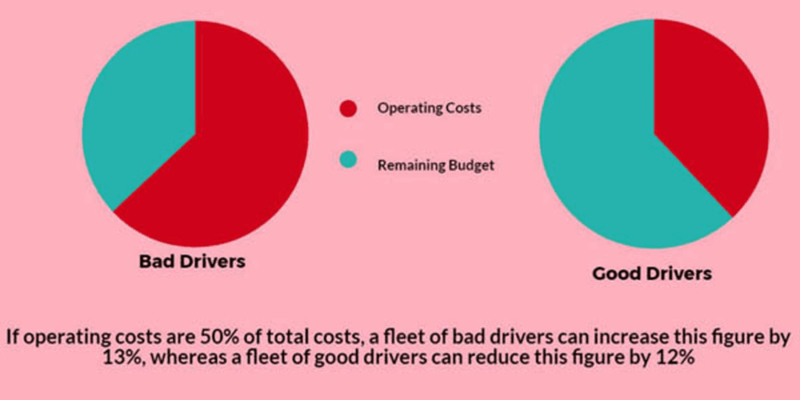 Based on the results, managers can later trim fleet expenses drawing the right conclusions and implementing effective cost management. Cargo optimization. This feature makes the most effective use of cargo space, and thus, better utilization of resources. 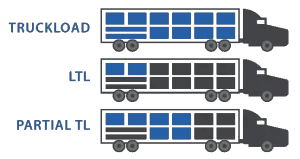 By taking the volume, weight, and dimensions of what is being transported into account, FMS determines the most efficient load the vehicle can carry. It’s particularly important when dealing with less-than-truckload (LTL) shipping. Pairing load optimization software with GPS tracking, fleet managers can find the most fuel-efficient loads for each truck in the fleet. Inventory functionality. Inventory control capabilities handle recording, tracking, costing, cycle counting, and automatic reordering to ensure availability and the right number of parts on hand, thereby reducing vehicle downtime. Besides inventory management and optimization, basic features include demand forecasting and replenishing, equipping, lot traceability, reporting and analysis, and vendor-managed inventory. Safety management tools protect your vehicles and drivers by providing emergency roadside assistance, vehicle theft alerts, and remote monitoring. Being able to monitor a driver’s time of arrival, speed and more, fleet companies can secure themselves from false claims. Road hazard alert. Alerting services keep drivers informed in real time of the state of the road, the weather, or last-minute changes on the route. Such services automatically notify drivers when they’re approaching potential roadway weather hazards. Remote control. Vehicular control mechanisms enable tracking and gradually reducing the speed of an asset. This can be particularly beneficial in retrieving stolen vehicles. Accident detection and reporting. 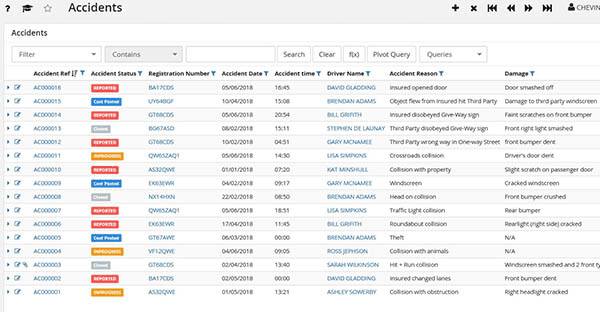 If drivers happen to get into an accident, fleet accident management software allows for capturing necessary data live from the field to further support claims, repairs, and risk management. Using the software, fleet managers can then track the accident’s progress including repair cost. On top of that, the software can analyze the accidents and generate reports on potential risks and driver training requirements. Roadside assistance. Should fleet drivers experience any roadside issue, they can request help via their telematics device with integrated roadside assistance solution. The latter dispatches a service request to the closest provider, ensuring a fast response. A driver can then track the service vehicle driving to their location. Dash cam. Automatically making photos, videos, and panorama thumbnail views, a dash cam can playback the entire event. Integrated with telematics, a dash cam provides visibility into the incidents and driver behavior. We hope by now you realize how much benefit you can reap from implementing a fleet management solution. So it’s high time to go over the FMS solutions that can help your business handle its transportation needs. The players included in this section are among the top 20 most popular options according to Capterra reviews. Further, we’ll give a brief overview of the leading fleet management solutions highlighting their stand-out features. Around since 1996, Geotab provides time-tested, comprehensive fleet management solutions. As a global leader in telematics, the company offers end-to-end telematics technology including GO plug-and-play vehicle tracking devices and MyGeotab software. Geotab collects info and transforms it into high-value fleet management data a business can then act upon. 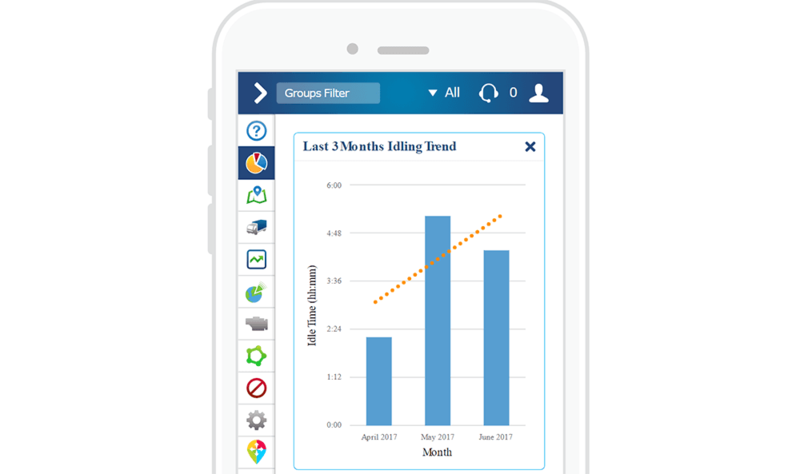 For instance, Geotab’s benchmarking reports compare the activity of one group to another by identifying idling trends and visualizing performance in fleet safety and productivity. 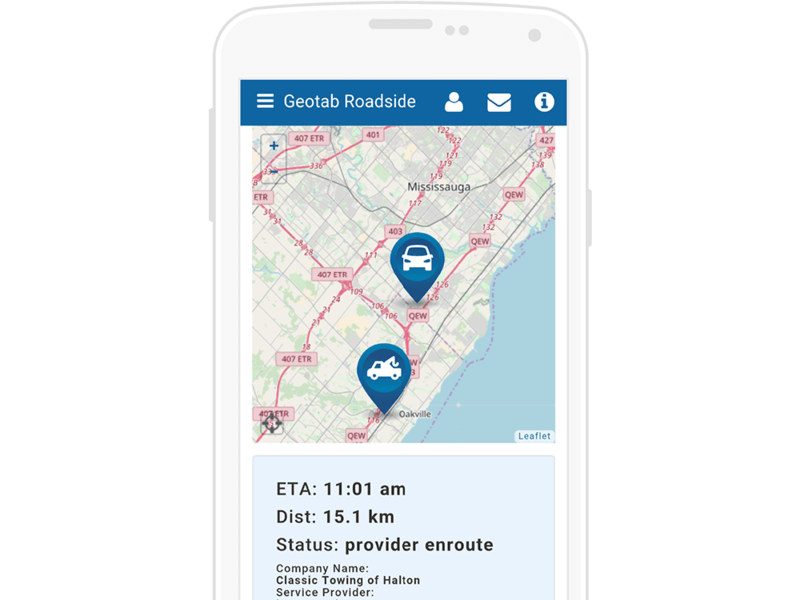 Geotab’s rich functionality includes customizable mapping, GPS vehicle tracking, route optimization, engine health and maintenance, and open data integration. With the Geotab Drive mobile app that tracks Hours of Service, you can meet FMCSA regulations including DVIR and ELD compliance. Proactive vehicle maintenance. Geotab maintains engine health by detecting issues early on and setting up vehicle maintenance reminders. In-vehicle driver feedback and coaching tools. These functions foster safe driving behavior. We at AltexSoft worked with the Geotab GPS tracking hardware solution while finalizing and documenting the project requirements for our client. The client needed a software solution for advanced driver training, safety, and risk management capabilities. Our project team developed the functional specification for the project, provided the software structure, and created key product wireframes. Navigation for accurate turn-by-turn directions. Although their customer support team operates at scale, many Verizon customers express their deep dissatisfaction with its customer service. 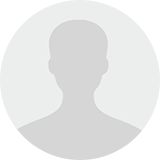 Among the complaints are multiple transfers of the issue without any actual assistance. Verizon Connect’s rich features cover distribution, fleet maintenance, fuel, and transportation management, GPS tracking, logbook, logistics, service, and transportation dispatch. Route replay. By caching historical journey data, Verizon lets you review where and when your drivers were, what routes they took, how long their stops lasted and whether they broke the speed limit. Proactive alerting. While monitoring unwanted driver behavior, the system notifies accordingly upon identifying any violations. Driver ID feature. Logging in your drivers allows for keeping an eye on individual drivers even if they use several vehicles within the company. Accompanied by driver scorecards, Verizon tracks the driver’s performance. It detects good drivers to incentivize, and those who may need more coaching. Director is a cloud-based GPS fleet tracking software product of Teletrac Navman, one of the largest FMS vendors in the world. This cost-efficient solution offers a comprehensive range of customizable features. As a result, no matter the fleet size, Director should work fine for most individual needs. Fleet visibility. Paired with hardware units inside the fleet’s vehicles, Director’s central dashboard displays each vehicle’s location and status in real time. Managers can track the fleet via a satellite view, a clickable list of vehicles, a GPS map, or an in-vehicle street-level camera. Dispatching. Director allows drivers to message dispatchers and vice versa, even offering canned responses to further streamline communication. Non-verbal check-ins. With the touch of a button or even automatically, a driver can check in the destination, proof of delivery, and HOS. Dynamic dashboard. 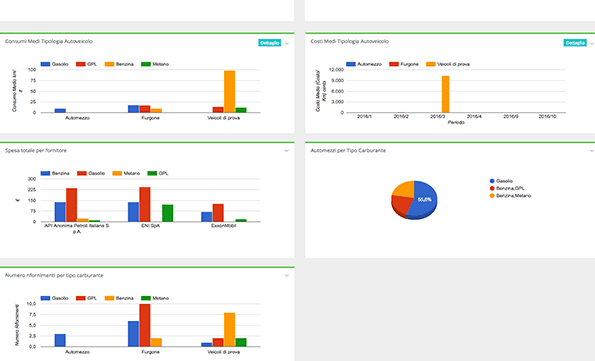 Director enables fleet managers to create a personalized dashboard for summarizing their KPIs. Vehicle diagnostics. Providing the insight into the condition of the fleet vehicles, Director informs you of the amount of fuel used, idling time, whether the drive goals are met, and whether any vehicles are in use without proper authorization. Driving Safety Alerts. The system allows for automatic alerts that instantly address poor driving, including idling, harsh turning or acceleration, speeding, and compliance violation. While Director is suited for fleet managers, drivers use an in-cab solution – the DriveApp and software suite. Using a tablet device, drivers can auto-record their HOS and vehicle diagnostic data, generate the E-logs and DVIRs for a roadside inspection. 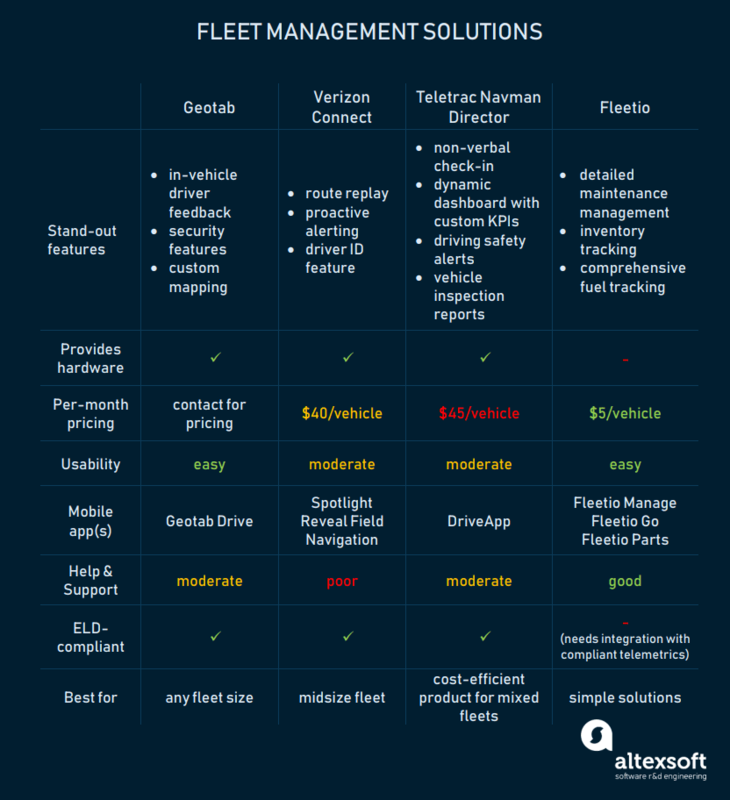 Unlike other FMS on this list, Fleetio doesn’t provide a hardware component to collect vehicle data, which is why it’s not ELD compliant. However, this problem can be solved with third-party telemetrics integrations. Keeping it simple, this solution offers a robust proprietary FMS – Fleetio Manage, and free mobile apps – Fleetio Go and Fleetio Parts for drivers to report their start times, fuel use, daily vehicle inspections, and in the case of Parts, vehicle parts for replacement. Maintenance management. 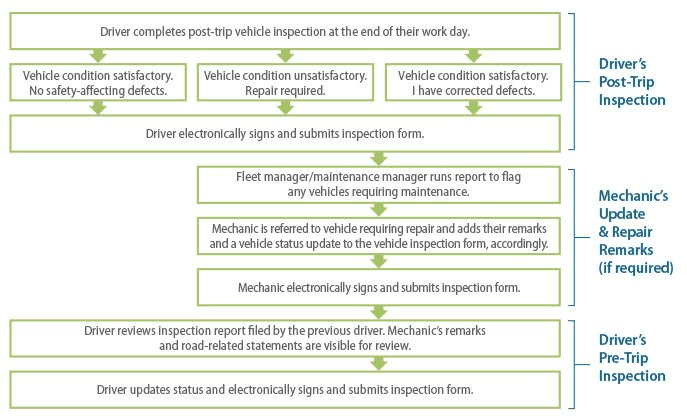 Tracking fleet maintenance needs, the FMS reminds of an upcoming vehicle inspection, registration or an emissions test. Emergency notifications allow managers to respond quickly to instances. Fuel tracking. Besides keeping a record of fuel usage, Fleetio Manage automatically calculates the fuel economy providing managers with the preliminary data to determine an efficient fuel economizing strategy. In addition, the software enables fuel card integrations. Driver scheduling. Via the Fleetio Go app, drivers get assigned routes or inspections, while managers track each assignment by vehicle. Parts and inventory. Using Fleetio Manage, operators can track the number of spare parts available, getting notifications to restock them when needed. The fleet management industry is marching into the era of IoT, adopting more effective ways of driver-vehicle communications and vehicle-to-infrastructure connectivity. Soon, telematics is going to become factory-installed equipment. As the data keeps multiplying, it’s going to demand a more sophisticated approach: from predictive to prescriptive analytics. Behavior monitoring solutions. More apps with driver scorecards are expected to be developed. Tracking and measuring driver behavior will promote better decision making, and decrease safety and productivity costs. A trend for video analytics is going to hit the industry this year. Requiring onboard computers with 4G and GPS, G-sensors, and IP cameras, this technology can be a great help in reducing accidents and cutting down on wasteful activities such as unnecessary fuel consumption. enhanced remote processing of fleet-related data and transactions. Advanced Driver-Assistance Systems (ADAS) are the systems that leverage AI, deep learning, and machine vision technologies. It’s anticipated that ADAS will keep getting smarter, which will result in safer road use. One of the latest innovations here is predictive maintenance. It uses onboard sensors to predict when the vehicle may need repair. It can be paired with preventative maintenance systems that track maintenance tasks by date, mileage, kilometers, hours, or fuel consumption, and provides automated maintenance-due to notifications. Business intelligence. Based on internal/external data and the company’s historical trends, intelligent analytics allows for identifying areas in fleet operations where money can be saved. Autonomous vehicles will enhance efficiency with self-driving capabilities. Further, the vehicles will improve road safety with integrated car technologies like forward collision avoidance. Environmentally friendly logistics. As environmental consciousness is taking new turns, more fuel-saving measures are added. It’s so important to have routing software to prevent fuel loss. More mobile apps for fleet operations. Allowing drivers to stay in constant communication, mobile devices are certain to become the primary tools for handling fleet tasks. To find out more about how technology drives change in transportation (trucking, air freight, and maritime shipments), check out our infographic.